But, yesterday was the first day of advent. I am a bit of tradition hound. I love em. I really do. And now that I have children it is so very wonderful to keep up old ones and start some new ones as well. This advent calendar is something I have had in mind for sometime and a little elf so kindly delivered just in time. Yesterday Miles cautiously opened the tiny “1” door and divvied out the chocolates. We were quite surprised he wanted to save a few for later on and not devour each one right there after breakfast. The tiny note read flashlight tag. What is more fun than flashlight tag? Really. 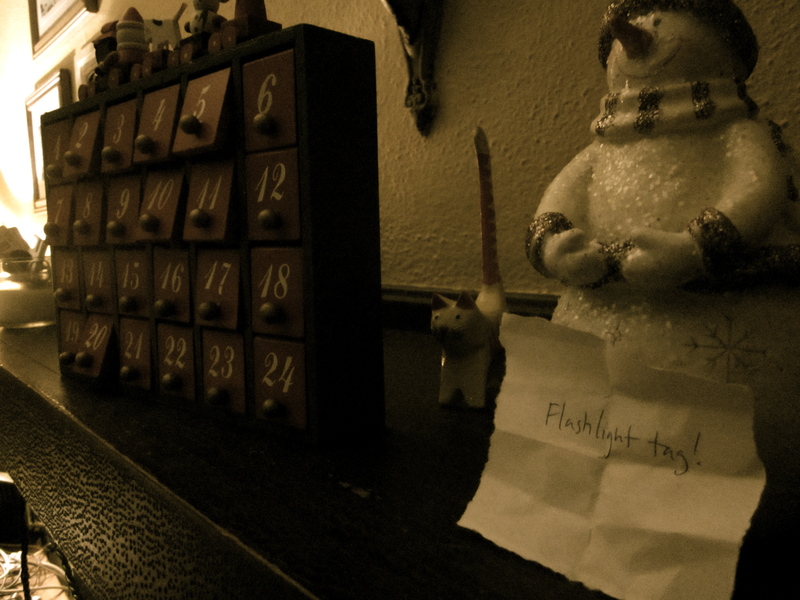 This entry was posted in traditions and tagged advent calendar. Bookmark the permalink. Flashlight tag sounds like good fun. We’ll have to try that with our children! I love Advent, and opening a new box each day. Candy is such a rare teat here that it makes opening our calendar extra special. love it, thanks for visiting! I knew the spelling of “babcia” as you had it was wrong but the meaning, well I just made that up — didn’t your mother tell you we make things up! lol! well it gave me a good laugh anyways!